Just got home from a bit of an intense trip to Scotland, packing in a really busy program in just five days. It was great to experience a little high pace BJJ globetrotter-style traveling again, and I even ended up taking home a few medals. Due to a school holiday this week, the tickets for the relative short flight of just 90 minutes, were really expensive. Most of the guys on the team decided to pass on the trip and save the money for other tournaments in the upcoming weekends. Never letting down an opportunity to see the world, I decided to go anyways. Two of my training partners, Kasper and Ben, went along and I met up with my scottish friend and fellow BJJ globetrotter, Dan, who I traveled with in Taiwan, New York and Estonia during my trip. First stop was Aberdeen on wednesday, a city that is all gray from the granite blocks that has been used for basically all the buildings. A small group of guys are running a Jiu Jitsu gym, where I was teaching for two nights. They were mostly beginners, but there were some quite skilled blue belts in between. We also managed to do a bit of sight seeing in Aberdeen, going mountain biking in the highlands and visiting an awesome castle on a cliff. Early (!!) saturday morning, we drove down to Glasgow for the competition. It was held in a big sports hall and there was quite a few competitors. Mostly lower level belts though - me and my opponent in the gi division were the only two brown belts signed up. I had a loooong wait before my matches would start, so I spent the most of the day coaching the guys I had trained with. I love coaching at competitions, and they were all doing a really good job, most of them taking medals in their divisions. I wasn't nervous about competing, as in I didn't have any particular thoughts in my head about it doing the day. Despite that, I could observe, that my heart was beating a bit faster, and I had to go take a piss about ten times during the day. Definitely a slight adrenaline release activated for all those hours. I was mostly worried about getting dehydrated during the wait, so I made sure to drink a lot of water. 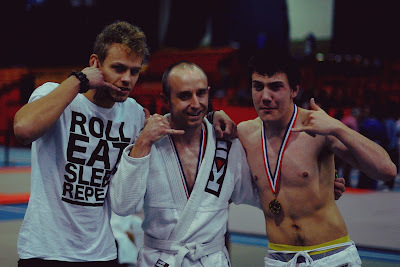 There was no-one in my weight category (-79 kg) in the advanced division, so I was moved up to -85 kg with the big guys. First opponent was a swedish guy, who I had just seen win his first match with a pretty solid game. I decided to play a bit safe in the match and try and beat him with my guard. He felt very strong, so when I had the opportunity, I pulled butterfly guard. Standing up with double underhooks to try and take him down did no good, so I pulled guard again. At one point he tried to pass my scissor guard by putting his hand through my legs and I had an attempt at a spinning triangle counter. He postured up at the right time and defended it. I knew he would be difficult to sweep as his base was really good, so I went for a guillotine to try and get an advantage. Tapping him out with it would be hard, so I just held on long enough to convince the referee to give me an advantage. As soon as it was on the scoring board, it was just a question about not getting passed for the rest of the time. The whole day, I hadn't seen any referees give warnings for stalling, so I just happily stalled away in my closed guard until time ran out. At one point, I looked at the camera and made a silly face at it. Don't know why I chose to do that, in fact I think it was probably a bit douchy and overconfident, but I have pretty much never been able to take anything seriously in life. 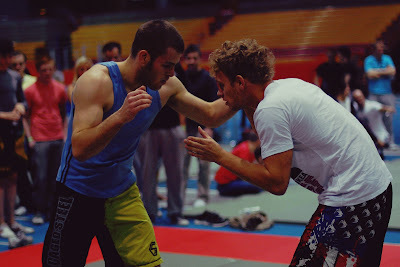 Second match was the final against an MMA guy, who seemed to be in good shape, bigger and stronger than me. I had really missed the wrestling aspect of competition for a loooong time since I hurt my knee last year. It is something I really enjoy in training and since my knee has gotten much better, I decided to wrestle him for a while just to try it out in competition as well. I had attempts at my armdrag single leg and fireman's carry, both of them with no luck. A little bit maybe, since I got an advantage for the fireman's carry attempt. Eventually he ducked under for a nice double leg, and don't know why I am being so lazy in defending it, but I for some reason just sits down and accepts it. Getting back up, I decide to just pull guard from there on. Being behind by two points to one advantage, I knew I just had to get one sweep then hold on to win. I went for the deep butterfly halfguard and pulled his foot across for the calfcruncher submission (with which I unfortunately popped both mine and my opponents knee in this match). I felt him rolling, so I decided to ditch the sub and go for the sweep instead. With a bit of scrambling and wrest-jitsu, I got him on his back. During a guardpass attempt, he stood back up and I pulled guard once more. He tried an ancle lock in the last seconds, but I was having none of it, and wrestled him down for the sweep and the last two points, ending the match 4-2 in my favor. I was supposed to compete in the open weigh advanced division as well, but it started right after my two long matches with the big guys and I was feeling pretty tired. I only had one opponent with the gi, who had been driving three hours to get to the competition, so I prioritized giving him a good match instead of trying out the same guys I just fought. 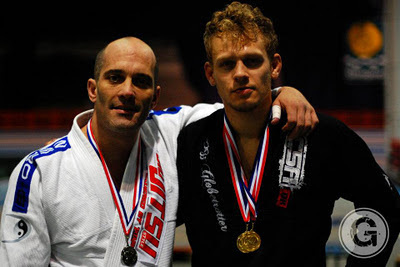 The gi match was a "superfight", since we were the only two competitors over purple belt. My opponent was in -88 kg, but I accepted the challenge. He was a really nice guy and we had a good chat before the match. I had decided to pull guard and play from there, since he looked to be much heavier and stronger than myself. Initially, I was trying to set up a sweep, that I was succesful with in the open weight final of Swiss Open, but he either knew it already or had read my blog and prepared for it, because he was posturing perfectly to defend it. Since the referee didn't mention anything about my fingers being inside the opponents pants, and thereby giving me a nice solid grip, I decided to stay there and give it a few more tries, before I eventually had to change tactics and switch to spider guard. An opportunity for a triangle choke presented itself and I took it, getting the tap out. I will be competing again in Paris on November 5 at the NAGA Europe. The day after the competition, we went to Edinburgh, where I taught a class. I was ridiculously tired from the competition, night out and lack of sleep, so I sparring with the guys was horrible. I normally never ever go out the night before I am teaching, but we had to celebrate a little bit. A solid group of guys there, I wish I could have enjoyed the rolls more, but I will definitely be back one day. I promoted one of the guys to blue belt, who was doing really well in the competition the day before and was tough to roll with. All in all, some eventful five days in Scotland with lots of cool experiences and new friends!